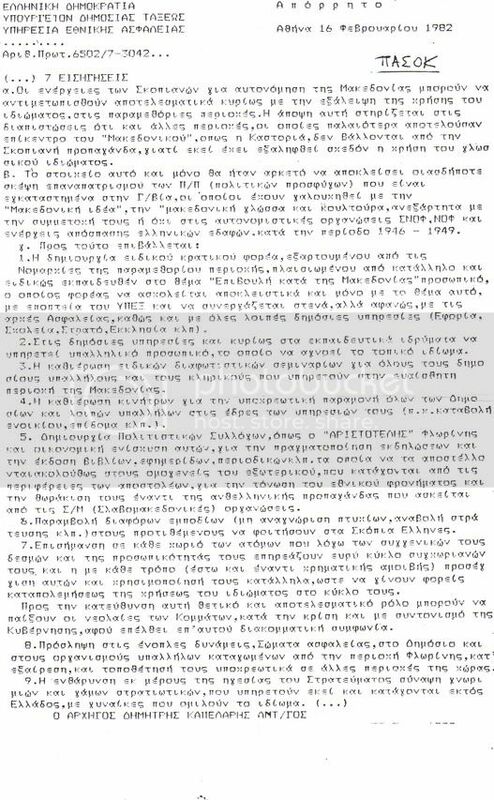 The Greek agenda towards the ethnic Macedonians, 1982! On October 1981 national elections in Greece, PASOK (The Panhellenic Socialist Movement, a centre-left political party) won a landslide victory with 48% of the votes, capturing 173 seats in the Greek Parliament. One of the first things on this new government’s agenda was to initiate a campaign to force the population into believing that there is no Macedonian nation and to generally remove the term Macedonia or Macedonians from use. This is the document they issued to that affect. a) The Skopians’ activities for the autonomy of Macedonia may be efficiently confronted mainly by wiping out the use of the idiom, in the regions near the borders. This opinion is based on the realizations that also other regions that in older times were center of “Macedonism”, like Kastoria, are no hit by the Skopian propaganda, because there the use of the idiom has been almost wiped out. b. In the public services and especially in the educational institutions the employees who will be in service have to be ignorant of the local idiom. c. The establishment of special enlightenment seminaries, for all the public service employees and the clergy who are in service in the sensitive region of Macedonia. e. Establishment of the Cultural Association, like “ARISTOTELIS” in Florina and economic help to them, for the realization of events and the publishing of books, newspapers, magazines, etc. And afterwards these will be sent to the Diaspora abroad who has origins from the regions of the senders. This will boost their national sentiment and they will be protected from the anti-Hellenic propaganda that is been practiced by S/M (Slavmacedonians) organizations. f. Insertion of various obstacles (non-recognition of diplomats, postponement of military service, etc.) for the Greek students who wish to study in Skopje. g. Marking in each village of persons who due to their kin bounds and their personality influence a large circle of co-villagers and with any means (even with money payments) get close to them and use them properly so they will behave as the fighters of the use of the idiom in their circle. To this direction a very positive and effective role can be that of the Youngerss of the political parties, by the judgement and coordination of the Government, when a between parties agreement will be reached. h. Recruitment in the Armed Forces, in Police Bodies in the public services and Organisations of employees with origins from Florina region, by exception, and their obligatory location in other areas of the country. i. The encouragement, by the leadership of the Army of meetings and marriages of Army officers, who are on duty, there and have origins abroad, with women that speak the idiom.